The Parkinson's Disease Biomarkers Program (PDBP) is a recently-formed NIH initiative to advance research into biomarkers for the disease in order to better understand its progress and develop treatments. Some funded projects will focus on statistical analysis tools and data sharing among researchers. Others will examine early clinical manifestations of PD in patients. Still more will involve lab studies, including identification of genetic biomarkers as well as antibodies in the blood and changes in body chemistry. All projects "must inform the etiology, pathogenesis or treatment of PD," according to grant program guidelines. Research supported by the PDBP is being carried out at the 11 Morris K. Udall Centers of Excellence in Parkinson's Disease Research (logo right), directed by the National Institute of Neurological Disorders and Stroke (NINDS) within the NIH. 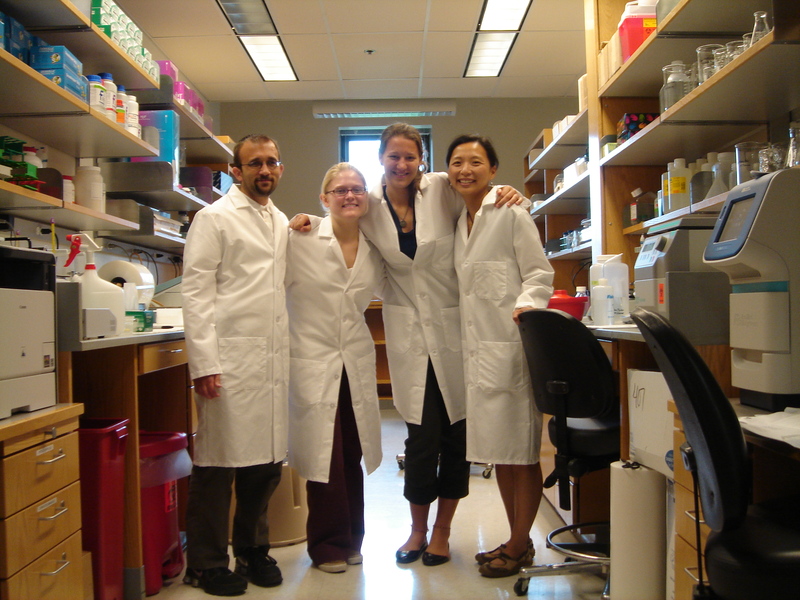 Parkinson's Disease Biomarkers research at Penn is led by Dr. Alice Chen-Plotkin's research team in the Chen-Plotkin Lab within the Neurology Department (located in the Johnson Pavilion). She is a recipient of PDBP funding of $475K for her study Unbiased Approaches to Novel Biomarker Discovery in Parkinson's Disease. Unbiased refers to taking an untargeted approach to seeking biomarkers -- a technique that is only now possible because of advanced processing capabilities. Now researchers like Chen-Plotkin can look at hundreds or thousands of potential biomarkers at once, which is a major advance in genetics/genomics research. This unbiased method of investigation in the past few years has led the Chen-Plotkin Lab (established in 2010) to discover, and subsequently replicate, a novel association between plasma levels of epidermal growth factor (EGF) and cognitive impairment in PD. The current research will seek to validate those results, identify further plasma-based PD biomarkers, and push results into translational studies. Dr. Chen-Plotkin, MD, is also a clinical neurologist at Pennsylvania Hospital. In addition to the recent PDBP grant, Dr. Chen-Plotkin has ongoing research funding from the Burroughs Wellcome Fund Career Award for Medical Scientists and an ongoing NIA award for the study Regulation Of Gene Expression In Frontotemporal Dementia: A Genome-Wide Approach. Her hard-working lab group enjoys occasional bowling matches against her husband's lab team in the Plotkin Research Group in Mathematical Biology, also at Penn. Biotechnology Calendar, Inc. is a full-service event marketing and planning company producing on-campus life science research tradeshows nationwide for going on 21 years. We plan and promote each event to bring the best products and services to the best research campuses across the country. Life science researchers, purchasing agents, and lab managers are actively invited to attend to see the latest products and equipment and discuss their laboratory tool and service needs. See our Nationwide Show Schedule for 2013.